Add a Sensor - NexSens Technology Inc.
A sensor can be added to an iChart project file if the system setup has changed or needs to be redone. Note: The device will be reprogrammed in these steps and all data will be lost. Please download all data before proceeding. 1. Open iChart with the current project. 2. Select Project | Setup Device Wizard. 3. Click Next until step 3 is reached. 4. 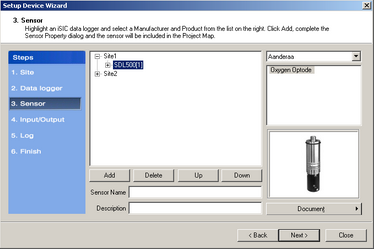 Select the data logger to which the sensor will be added. 5. Choose the sensor manufacturer from the dropdown list on the right. 6. Select the correct sensor from the list of sensors. 8. 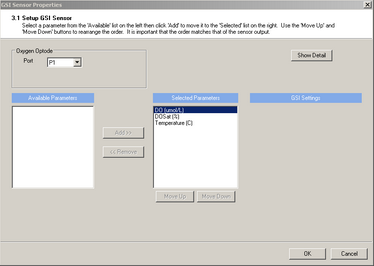 Select all appropriate settings per the sensor’s configurations. 10. Click Next until step 6 is reached. 11. Select the data logger to which the removed sensor was on. The iSIC will now be programmed with the new configuration.